The real name of Bangkok is the longest city name on Earth. Bangkok is the capital of Thailand and the largest city in the kingdom. Thai people don’t call this city Bangkok, it is commonly called in Thai กรุงเทพมหานคร “Krung Thep Maha Nakhon”, or just กรุงเทพฯ “Krung Thep”. When the King Rama I (The founder and the first monarch of the reigning House of Chakri of Siam (now Thailand)) established his new capital on the river’s eastern bank, he named it “กรุงรัตนโกสินทร์อินท์อโยธยา” Krung Rattanakosin In Ayothaya. Later, the King Rama III changed it to “กรุงเทพมหานคร บวรรัตนโกสินท์ มหินทอยุธยา” Krungthepmahanakhon Bawonrattanakosin Mahintharayutthaya. Then the King Rama IV changed it to Bangkok’s current Thai name. English translation : Erected by Visvakarman at Indra’s Behest. Why is Krung Thep called Bangkok in English? 1. It is believed that the area was the Hog Plum forest in the old time. Hog Plum in Thai is called มะกอก /ma-gawk/. บาง /baang/ is the old Thai term for village, so people called that area บางกอก /baang-gawk/. 2. There was a record of a priest saying that Bangkok was Thonburi province; บาง /baang/ means บึง /bueng/ meaning ‘swamp’ and กอก /gawk/ means ‘the low land that becomes the highland’. 3. 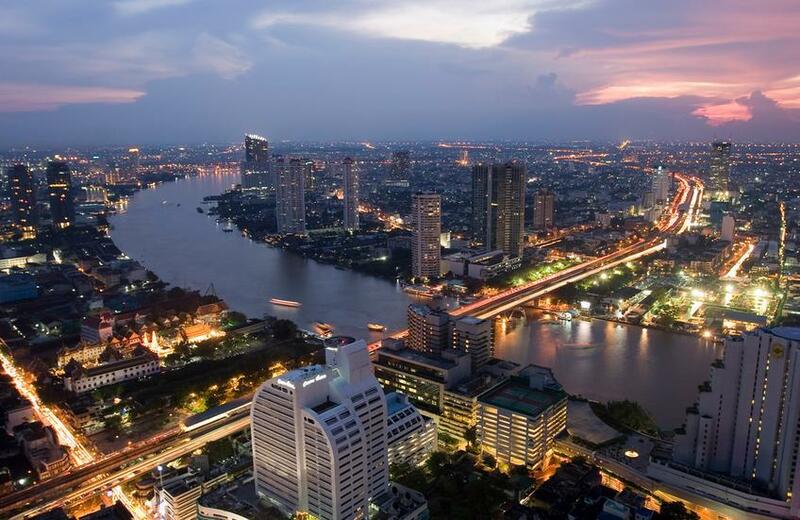 Some people assumed that Bangkok is derived from the Malay word – Benkok meaning ‘bend, curve’ which refers to the curvy river running through Bangkok. 4. Some people assumed that it is derived from the word บางเกาะ /baangkoh/ ; เกาะ Koh means ‘island’ according with the curved Chao Phraya river and some surrounding areas were islands. 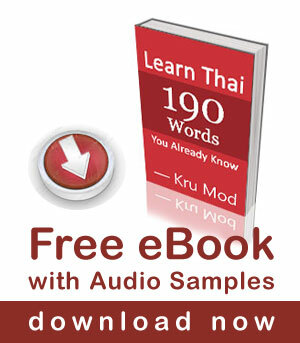 Hello Mod, I have only recently found your ‘LearnThaiwithMod’ on U-tube and Facebook. Your videos are excellent. You and Pear are really a great pair ! Your article about the names of Groongtaep and Bangkok was fascinating. But one thing I noticed in your introduction, you translated มหา (mahaa) as makaa, was that correct? Thanks. Englenes By, Den mægtige by, Den udødelige juvel, Verdens hovedstad kronet med ni dyrebare ædelstene, Den glade by, Overvældet af et vældigt kongepalads der er som det himmelske hjem hvor den inkarnerede gud regerer, Grundlagt af Indra og bygget af Vishnukarn. Wow, Kru Mod! Can I use link your article for my Social Studies students. I would want them to summarize the article. Normally I hear KRUNG THEP and MAHANAKHON (mahanakhon family always on taxi radios). Reading through the names though I notice many words are recognisable from other parts of the country (and eras). RATTANAKOSIN, AYUTTHAYA, RATRATCHATHANI, BURIROM etc…. Easier to learn than I thought. Bkk… my favourite and the best city in the world! Good question, I added more information about the name “Bangkok” already. Please see the article again. Thank for the Information about Bangkok. could you please tell us about Thai marriage. and if Thai people marry to and from foreigners. I am afraid I don’t understand your last question. Can you clarify please? Thank you. We are really amazed. Today we’ve had enough time to view all your posts about Thai engagement and marriage since it’s the Corpus Christi holiday in my country. Thank you laai, it’s very interesting. Congratulations for being part, and partaking these wonderful moments with all of us.